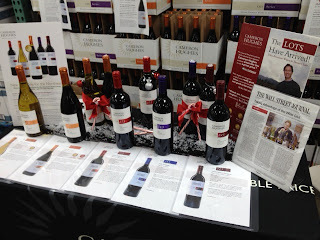 Costco in Waltham, MA had a road show featuring wines from the Cameron Hughes portfolio this past weekend. Strangely, the wines weren't open for tasting but I did take note of the inclusion of a Russian River Valley wine in the portfolio - their Lot 271 Pinot Noir. 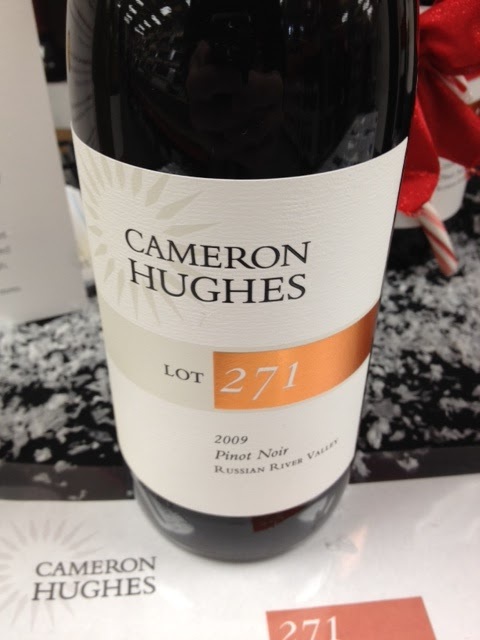 Cameron Hughes is the original American re-labeler who pioneered the art of bringing outstanding wines to consumers at a fraction of their original cost by working with wineries looking to shed excess finished wine inventory without tarnishing their brand. Over the past ten years they've expanded their endeavors into other labels and have become more involved with the winemaking progress. But the flagship "Lot Series" is where the majority of the action is and it's the wine we see around stores most frequently. California's Russian River Valley in Sonoma County is one of the most prestigious appellations for Pinot Noir in America, so it's worth taking note of this bottling from Cameron Hughes. It is not necessarily the most consistent however, so as you're considering bottlings across appellations from a given producer be sure to sample wines from other areas. There's fantastic Pinot Noir being made in the Sonoma Coast, Anderson Valley, Carneros, Santa Lucia Highlands, and the Santa Rita Hills in southern California to name a few. Medium bodied visually, the wine seemed impaired aromatically when I first opened it. However, after about 4 hours of breathing in the bottle it came around nicely. Varietally correct aromas and flavors for the appellation (the Russian River Valley of Sonoma County in California) - strawberries, black cherry, florals and a touch of cola. I'd like it more if it had more depth and intensity. It kind of hints in the right direction but fails to make a confident statement. That said - I like it a lot at the price point. Lots of reviews coming up in the next couple weeks here - I'd love it if you subscribed to the site to get regular updates! Question of the Day: Have you tried this wine? If so - what did you think? The day after I tasted this wine I ordered a case. To give you an idea of how rare that is, I haven't ordered a straight case of any wine since 2005. I've tasted over 100 different Pinot Noirs this year and the 2009 vintage from California has been a winner - more on that in this tasting report. I was leafing through Spectator's Wine of the Year issue last night and their crowning of a Cali Pinot Noir felt like a statement that California Pinot Noir deserves attention in serious wine enthusiasts' rotation. 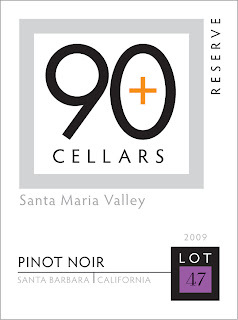 90+ Cellars is a Boston-based company whose business model is to take finished, bottled wines from producers with a pedigree of 90 point ratings and deliver them to consumers at a fraction of the cost of the original label. Their selections have come from all over the world. Their "Reserve" designation tends to be assigned to wines with a higher price point and esteem than their regular label - but their wines rarely exceed the $20 retail mark. This wine is available at retail for around $15 and I think it would fool a lot of people in a blind tasting of $40-$60 wines. Ample production should make this relatively easy to attain. I think our friends at 90+ have caught lightning in a bottle with this one. Confusingly similar to Sanford on the low-end and Sea Smoke on the high-end. Utterly delicious. Perfect floral/fruit-driven SoCal Pinot aromatics are the first things I noticed followed up by a satisfying experience on the palate. This one will sell out in a flash. I'm curious who the producer is. Fantastic stuff. Wow. For more information or to purchase this wine directly from 90+ Cellars visit their website. I'll look forward to comparing notes. On Saturday from noon to 5 pm, Wine ConneXtion in North Andover is hosting a 90 Points and Above tasting. Whether you love the points or not, it might be worth heading out to try the 2008 Anderson's Conn Valley Estate Reserve Cabernet they're pouring. The wine was rated 98 points by Robert Parker and is currently carrying an impressive 95 point CellarTracker rating. Best price in the country on Wine-Searcher is $85.99 - they've got it for $62.99 (plus no tax in MA). Nice price. Start calculating how much the gas will cost you to get there! You might not have heard about The Boston Globe's 2011 Plonkapalooza (since it's all paywalled up these days) but on Saturday, from 3 pm - 5 pm West Concord Liquors is having a tasting of a lot of the winners from Plonkapalooza. On Sunday from 1 pm - 5 pm, Fifth Ave Liquors in Framingham is having a Tasting Extravaganza. Check the link for a list of over 100 wines they'll be pouring - a nice range of styles and price points. All non-sale wines on sale 20% off for the day. Also on Sunday, from 1 pm - 4 pm is a Turkey & Wine Tasting at Bin Ends in Braintree. They're serving up the classic New England Thanksgiving dinner, with turkey, trimmings, and pie along with a selection of fine wines, sparklers, and dessert wines. Question of the Day: Any other cool tastings going on this weekend? The other day, I mentioned The Wine Cellar of Stoneham to a colleague visiting from New Jersey as a good store to check out for wine deals. I've tried quite a few of the wines they carry so I thought it would be a good time to share my thoughts and point out what I thought were some of the better value plays currently available. Right now, they're offering free shipping to Massachusetts on orders over $100 with Promotional Code "wwp". Have a look at the list below and take a look at their other selections on their website. And remember - there's no tax on wine in Massaschusetts. Free shipping, no tax, online shopping, and great prices. I like it. A beautiful Napa Cab that takes my definition of what I'm looking for in this category and pushes forward with a little extra. Drinking beautifully at this stage if you like your wine as it's just exiting its youthful stage - but hasn't yet settled into mid-life. I've had this wine at tastings before and have been impressed - but this was my first chance to sit down and get to know it. Visually it's opaque dark red/purple. As I swirl it in the glass some mild sediment is revealed on the edge of the glass. The aromatics were evident immediately upon opening, but reveals more with time. So much going on. Blackberry, black currant - deep dark fruit. Eucalyptus too, but in a mild supporting role. Savory notes. This wine is classic Napa/Howell Mountain fruit. Very satisfying on the palate with ample acidity, chalky cocoa powder tannins, and a million-mile finish. Don't see how I can rate this any lower. It's so well done. Wow - a beautiful wine. Medium-full bodied magenta. Aromatically beautiful with rich strawberry, red raspberry, and fresh clean earth which translates brilliantly to the palate. Silky texture balanced nearly perfectly with acidity and just a touch of tannic grip. A benchmark California Pinot Noir from and iconic pruducer. Highly recommended. A tremendous wine at a fantastic price here. I prefer the Petite Sirah and Merlot for near term consumption over the much more expensive Claret. They also have magnums of the 2007 Merlot for $79.99 - also outstanding. Super-high alcohol (16.2%! - but well concealed) powerful fruit-forward California wines. Light, elegant and layers of complexity. But somehow I was hoping for a little more at this price point. A plummy note feels out of place in a CA Pinot. Would love it at $25 but since it's more I doubt I'll be buying more. The wine is outstanding in my view but in this price range you can have some of the best CA Pinot Noir. What a pretty wine. Light ruby in color and mostly transparent. Austere by new world standards but with food it shines. Sufficient round fruit on the nose that turns more tart on the palate. Wonderful mineral flavors with considerable acidity and a touch of tannic bite. Would like to check in on this wine in a couple years but even now - very elegant. Very dark for a Pinot Noir. Darker than prior vintages of this wine I believe. Almost brooding. Still tastes very primary but I have a feeling this will evolve quite well. 90+ for now. We'll see where this one goes. I'll be buying more. It's a great value, especially when you see it in the $16 range. 60% opaque but light on its feet. The aromas on this are so distinctive - white pepper, earth, red fruit, and minerality. Quite elegant. The mouthfeel is light and it could give a little bit more of a punch without betraying its origin. That said, I do believe this provides a viable window into the pricey category Cote Rotie is. Medium to full bodied dark ruby red. Opens with substantial fresh plum and black currant aromas with supporting toasty oak notes. Enjoyable mouthfeel with a touch of acidity and blackberry flavors. A touch of sweet spice. A nice enjoyable wine. Aromas aren't pronounced but are vaguely pleasant generic "red wine" markers. Significant black currant. Some Rhone-like/Syrah aromas in the background. On the palate it feels brambly. A reasonably enjoyable slightly sweet/early aspect. But it taste a lot like grape juice. I don't think there's any Pinot Noir nor Cabernet in this wine. If I had to guess the composition I'd say Syrah, Grenache, Petite Sirah, and possible Zinfandel. Interesting. Not sure I'm ready to back up the truck on this one just yet. If you poke around in person or on their website I think you'll see good values at every price point. Drop me an email or ping them on Twitter (@WineCellarsMA) for more buying suggestions. Unfortunately, like all Massachusetts retailers they can't ship out of state. We'll need MA House Bill 1030 to repair that. Until then this deal is Massachusetts only. Question of the Day: What are some of the best deals you see at The Wine Cellar of Stoneham right now? 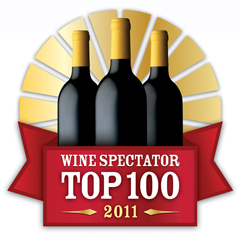 We're a little over a week away from Wine Spectator unveiling their 2011 Wine of the Year. As we have the past couple years, we're running a contest to see who can guess the top wine ahead of time. This year we're playing for a Kindle Fire ($199 value!) sponsored by New York wine retailer Grapes the Wine Company. Submit your guess as a comment on this blog post. If nobody guesses the 2011 Wine Spectator Wine of Year, the guess with the highest position on the list will win the prize. An X-factor we call excitement. But no equation determines the final selections: These choices reflect our editors’ judgment and passion about the wines we tasted. Last year's winner was the 98WS/$67 2007 Saxum James Berry Vineyard Paso Robles. With only 950 cases produced this wine was never in play for folks not on Saxum's mailing list which made the wine a surprising pick to me. The year before, the 95WS/$27 2005 Columbia Crest Cabernet Sauvignon Columbia Valley Reserve was more in line with what I think makes Spectator's Wine of the Year interesting. The wine was widely available at warehouse clubs in the high $20s prior to the announcement and now sells for over $100 at auction. To be successful, I think you need to have a sense for what category the publication would like to make a statement about. After the Saxum announcement heavy coverage came out about Paso Robles, and Saxum seemed to capture the essence of what's going on in the region. With the Columbia Crest Reserve the sentiment seemed to be value. What will they choose this year? 2009 California Pinot Noir? (best vintage evar!) 2006 Brunello? Bordeaux (2005) and Chateauneuf (2007) seem to be in a lull until 2009/2010. Napa Cab hit a peak in 2007 and didn't make the cut last year. Is there a new region they might like to highlight? The thing is - and sometimes this is forgotten when crunching the numbers - the wine needs to stand up to the scrutiny of all the Spectator editors. Not just the person covering the region. That's where I think there's some merit in tracking down wines in the Spectator Top 10. They tend to be pretty darn good wines if you can get your hands on them. Interesting side note: Last year's winner went on to do some freelance writing for Wine Spectator. Demonstrate your savvy here and you could work your way into a wine writing job in the big leagues! Ready, set, GO! Leave your entry below as a comment. Drop me an email (wellesleywinepress@gmail.com) or hit me up on Twitter (@RobertDwyer) if you have any questions. And let's let Grapes the Wine Company's Daniel Posner know we appreciate his making this contest more interesting by signing up for his mailing list (he offers some amazing deals) and/or giving him a shout-out on Twitter (@grapestwc). Contest closes Friday, November 11th at 11:59 pm Eastern.